Horatio Alger said “Go west, young man.” Even before that, frontierspeople left friends and family to brave the dangers of the westerly frontier. So on a beautiful fall day, we followed in their rutted trail, heading west on Highway 64 from Crivitz, with one important stop to pick up cheese curds (after all, we’re in Wisconsin). They’re so fresh they squeak when you bite in. 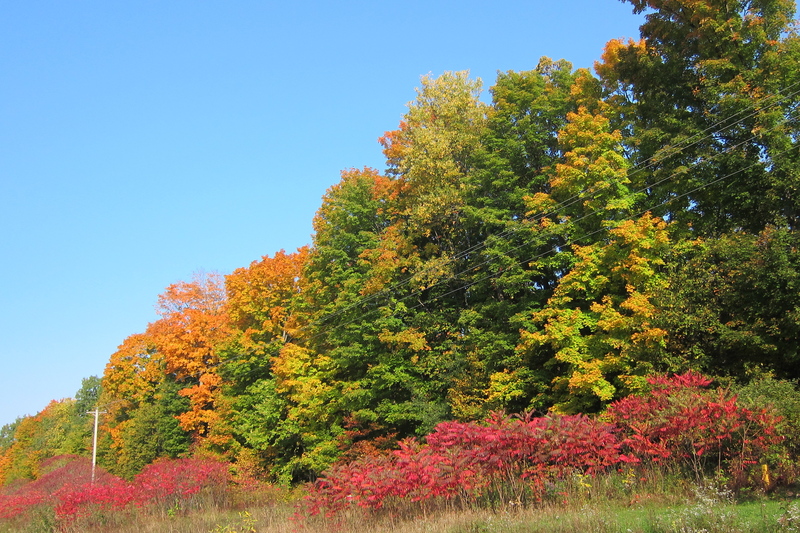 Fall colors along Highway 64. Red sumac in the front. Then it was an almost straight shot to Minneapolis, home of the Great Mall of America, with an indoor theme park. We had no interest in stopping there, however. 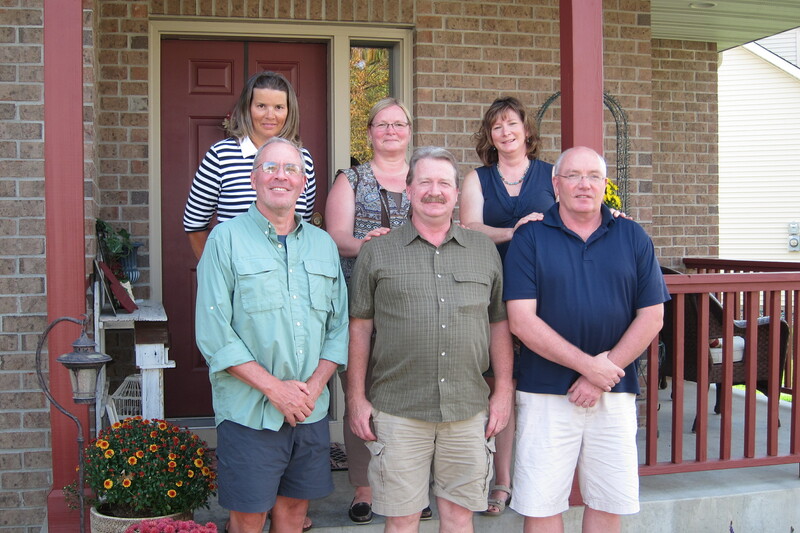 Instead we had a great visit with Nancy’s cousins, Kay and Scott, and their spouses. Scott (in the dark blue shirt below) and I haven’t seen each other in 17 years but he was easily recognizable; he looks just like his dad, my uncle. Kay and Tim (in the middle above) had just returned from a trip to Switzerland, a hop, skip, and small jump from our prior home in Geneva. We’re hoping they’ll come to visit us in France in the spring. Scott and Lori treated us to a spectacular lunch. They created a delicious homefry dish (shredded potatoes, cream of chicken soup, sour cream, and CHEESE). We’ll be making that once we have access to a kitchen. It was so nice to see family and fuel up on good food before our harsh journey west. 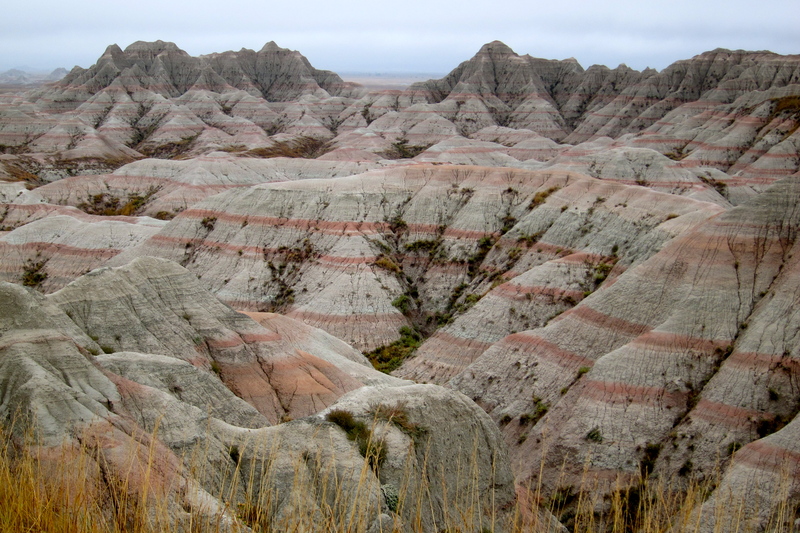 From 84 degrees in Minneapolis, we moved on to South Dakota and the Bad Lands. 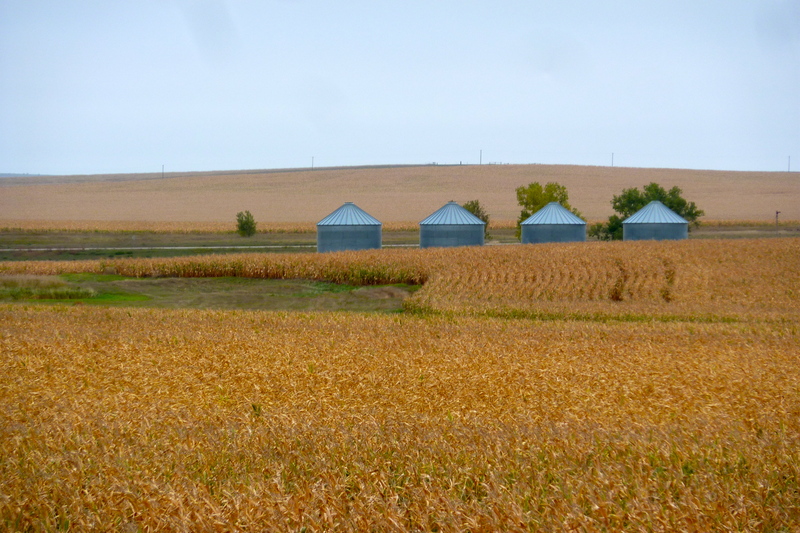 First a v-e-r-r-r-y l-o-o-o-n-g drive on I-90 (the same one that passes through Rochester NY), with lots of farming. 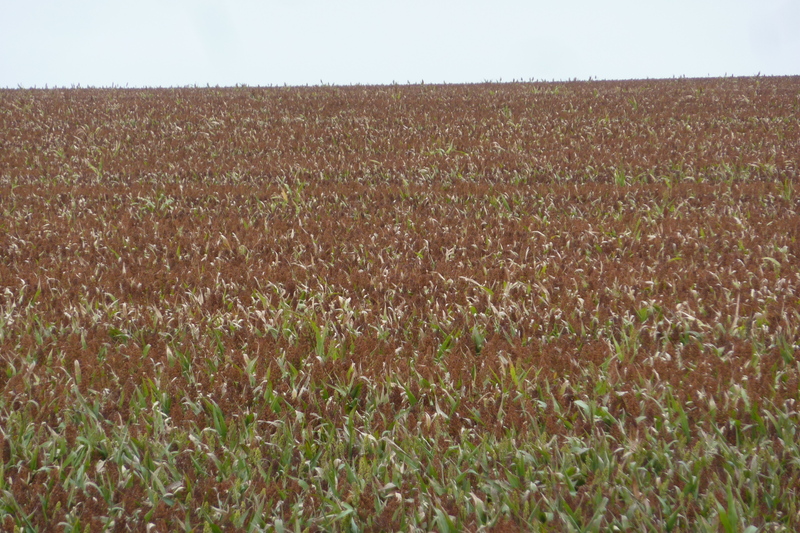 Corn…to eat or put in your gas tank? 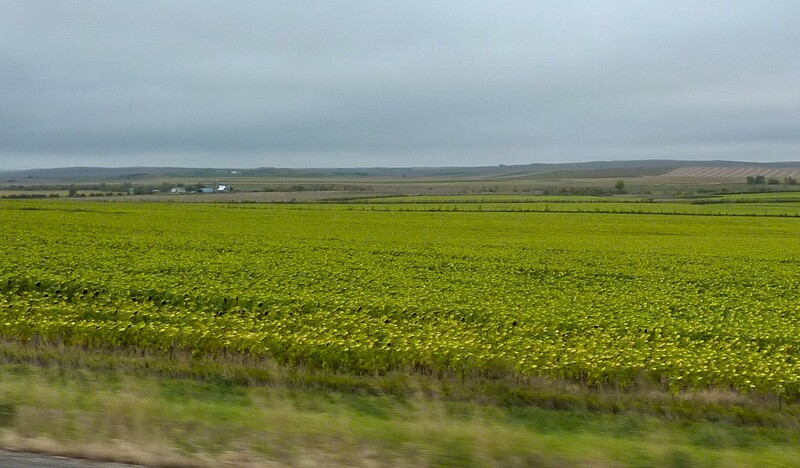 Notice the sunflower heads are facing the ground on this dreary day. 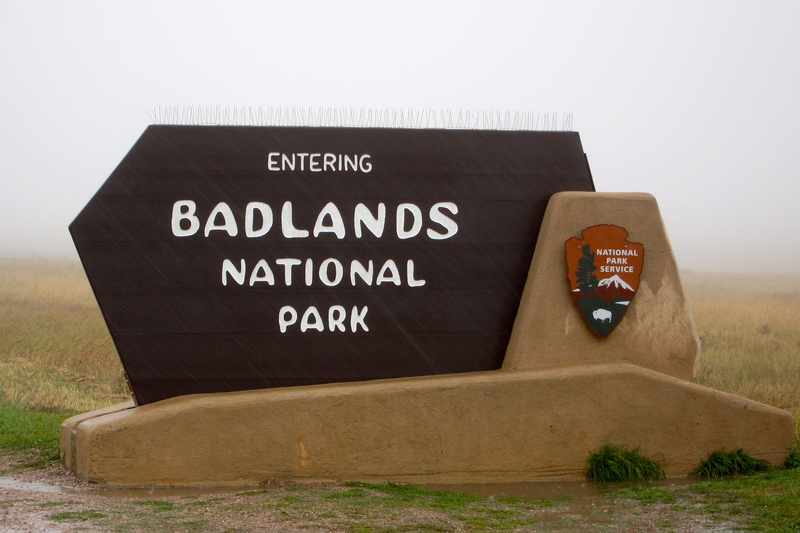 It’s fitting that we’re entering the Badlands National Park on a rainy (and chilly) day. Our first National Park on this trip. 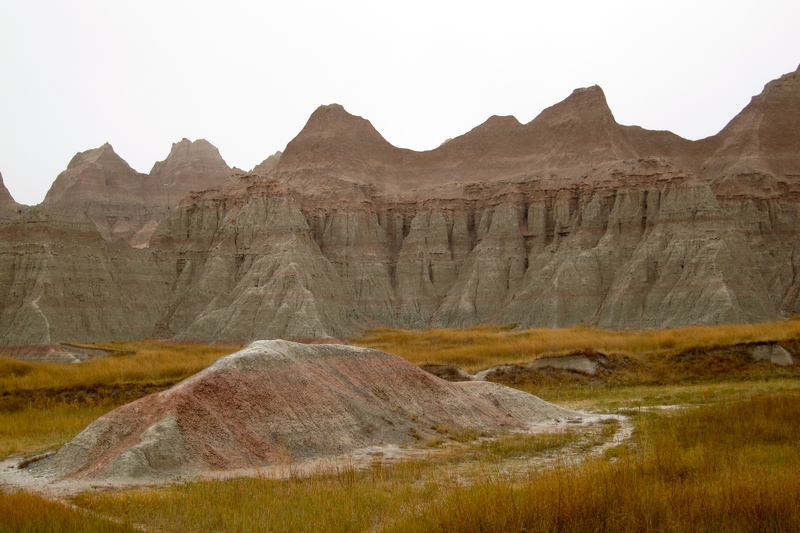 Without the rain, the Badlands would not have become bad. This area was a prairie 500,000 years ago. Then it started to rain and erode the soft soil. 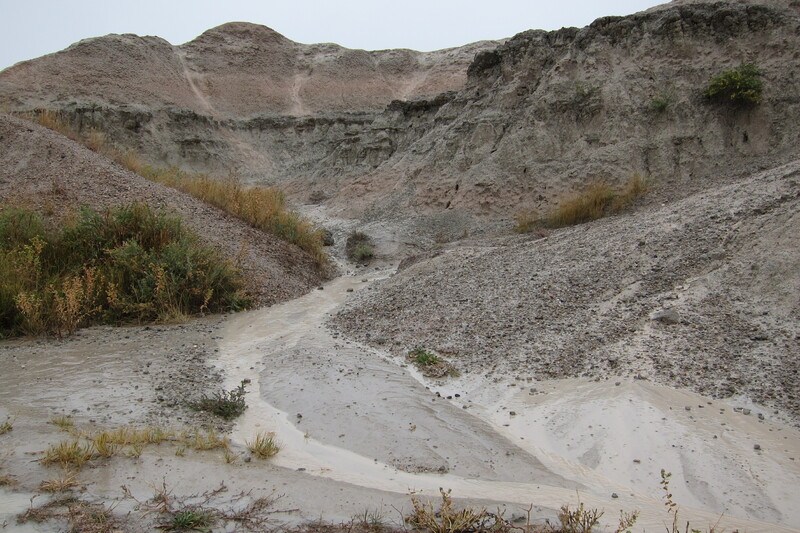 As the rivulets merged, more and more erosion occurred, digging gullies out of the soft limestone and leaving the harder sections standing. Tiny rivulets like this cause massive erosion. Even with the rain, we found fascinating views around every corner. 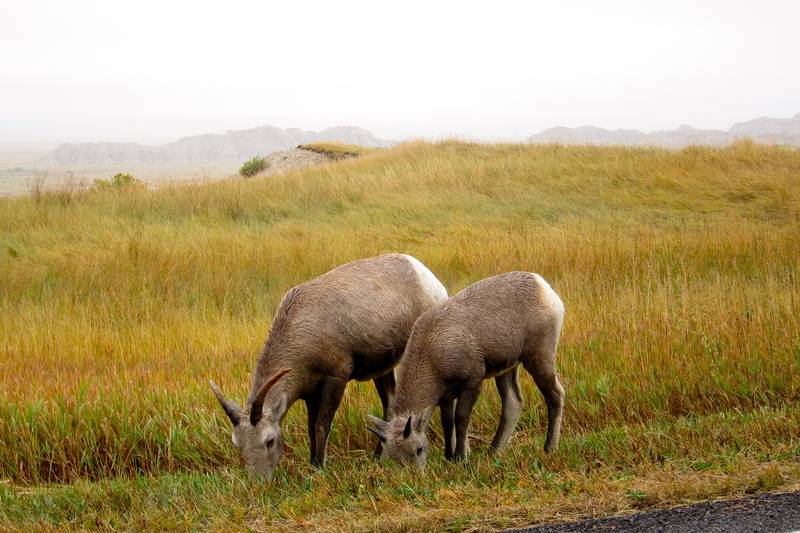 These animals ate peacefully, not worried about passing cars or imminent erosion. 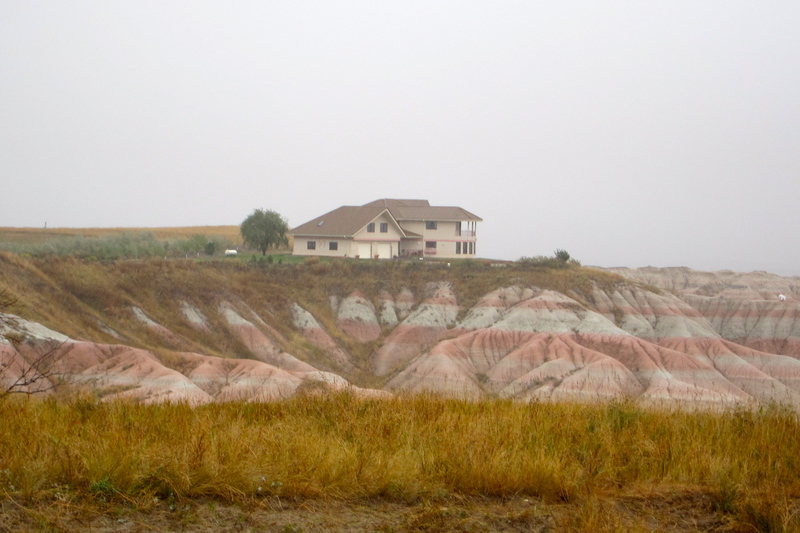 Chris, can this house get erosion insurance? Who knows why some areas stand tall and others succumb to erosion? The park ranger told us the soil in some areas erodes at a rate of one inch per year. At any moment, the soil beneath us could slip away. And the final product, acres of very bad, but strikingly beautiful lands. We’ve purchased our annual national park pass. Number 1 on the tour has been phenomenal. We’re ready for Yellowstone, Glacier, Olympia… We’re going to beat Mark and Sue Real at the “put the pin in the national park” game, at least until their next trip. 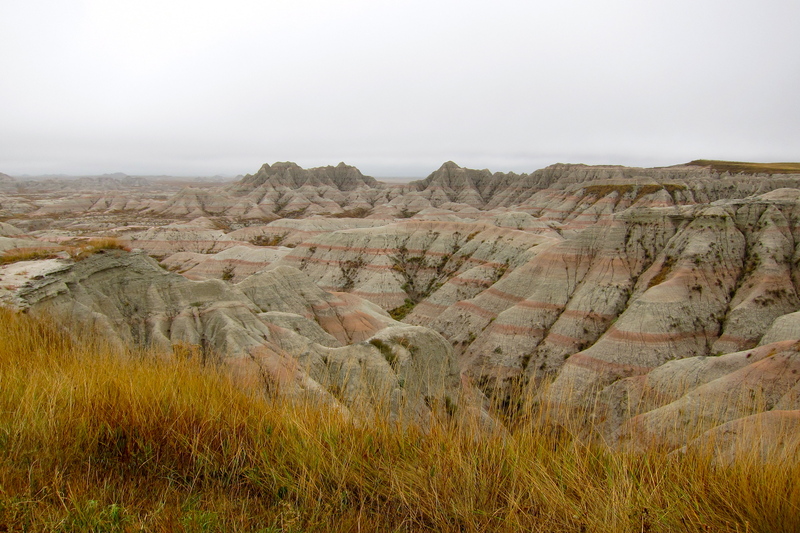 This entry was posted in Travel Journal and tagged Badlands, Mark and Sue Real, Minneapolis, national park, South Dakota. Bookmark the permalink.